Solvent-based inks are majorly utilized in various forms and on different types of surfaces, especially as a means of written identification for packing goods and commodities. Thus, a rapidly developing packaging industry is majorly driving growth in the global solvent-based inks market. Moreover, these inks are eco-friendly as they do not contain any harmful chemicals. They are resistant to wear-and-tear and outdoor elements too. Such factors have led to an increase in the demand of the solvent-based inks, thereby driving the relevant market to witness substantial progress. Currently, bio-based printing inks are made from rice bran oil, sugars, dextrin, and polysaccharides. They are then tested for their printing abilities. As per expert analysts, the global solvent-based inks market is foretold to register revenue valuation of US$7.92 bn by 2024, which is a decent increase from the initial revenue of US$5.42 bn clocked in 2015. This growth is prophesized to occur at a steady CAGR of 2.9% during the forecast period from 2016 to 2024. The global solvent-based inks market is segregated into numerous segments on the basis of several factors such as product type, printing type, application and region. Under product type, vinyl inks, vinyl-acrylic inks, epoxy inks, polyurethanic inks, and cellulose inks, are key segments present in the global solvent based inks market. From the perspective of application, packaging, books & catalog, advertising, tags & labels, office stationery, magazines, newspaper, and others, are chief segments. And under printing type, the global solvent-based inks market consists of segments such as lithographic, gravure, flexographic, screen-printing, letter-press, and digital. By type of product, vinyl inks are one of the most widely-used solvent-based inks across the globe thanks to their fast-drying properties and their ease in adaptation to different types of substrates. These advantages make vinyl inks hold the position of a leading segment by attracting maximum revenue. In contrast to this type, cellulose inks are expected to witness a rising demand during the forecast period mainly due to their compliance with several environmental regulations and bio-based solvents. This segment is projected to rise at a CAGR of 4.8% during the forecast period. From the perspective of printing processes, lithographic and flexographic printing processes hold a significant share in the market, and together comprised an estimated share of 65% in 2016. However, the demand for gravure printing has witnessed moderate growth in 2015 mainly due to its extensive use in flexographic and digital printing techniques. Under application, solvent-based inks are used on a large-scale basis in the packaging industry. In 2016, the market share for packaging solvent inks was registered at 36.40%. However, the publication segment that includes newspapers, magazines, books and catalogs, is expected to experience a stunted growth curve owing to a rise in online advertising and publishing. Geography-wise, the global solvent based inks market is spread across North America, Europe, Asia Pacific, Latin America, and the Middle East & Africa. Of these, a rapidly growing population as well the presence of renowned packaging companies in Asia Pacific has made this region gain extensive growth. Europe and North America too hold significant positions with respect to the revenue generated in this market, apart from Asia Pacific. Tokyo Printing Ink Mfg. Co. Ltd., Dainichiseika Color & Chemicals Mfg. Co., Ltd., Fujifilm Sericol India Private Limited, Royal Dutch Printing Ink Factories Van Son, Sun Chemical Corporation, Flint Group, Toyo Ink SC Holdings Co., Ltd., and Lawter Inc., are key players operating in the global solvent-based inks market. This research study analyzes the market for solvent-based inks in terms of revenue (US$ Mn) and volume (kilo tons). 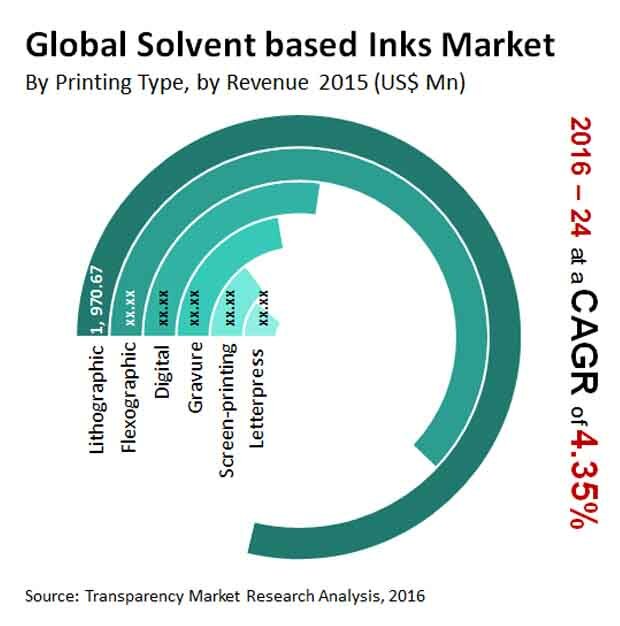 The solvent-based inks market has been segmented on the basis of product, printing type, end use applications, and geography. The report features a detailed regional segmentation with market growth forecasts for the 2016−2024 period. For the research, 2015 has been considered as the base year and 2016 the estimated year, while all forecasts have been given for the period from 2016 to 2024. Market data for all the segments has been provided at the regional and country-specific levels from 2016 to 2024. The report provides a broad competitive analysis of companies engaged in the development of solvent-based inks technologies for the solvent-based inks business. The report also includes key market dynamics such as the drivers, restraints, and opportunities affecting the global solvent-based inks market. These market dynamics are analyzed in detail and are illustrated in the report with the help of supporting graphs and tables. The report also provides a comprehensive analysis of the market with the help of the Porter’s Five Forces Analysis model, which helps in understanding the five major forces that affect the structure and profitability of the global solvent-based inks market. The forces analyzed are the bargaining power of buyers, the bargaining power of suppliers, the threat of new entrants, the threat of substitutes, and the degree of competition. Key players in the solvent-based inks market are Tokyo Printing Ink Mfg. Co. Ltd., Dainichiseika Color & Chemicals Mfg. Co., Ltd., Sun Chemical Corporation, Flint Group, Toyo Ink SC Holdings Co., Ltd., Lawter Inc. , Yansefu Inks and Coatings Pvt. Ltd., Siegwerk Druckfarben AG & Co. KGaA, Sakata INX Corporation, Huber Group, Zeller+Gmelin GmbH & Co. KG, ALTANA AG, Wikoff Color Corporation, SICPA Holding SA, Fujifilm Sericol India Private Limited, Royal Dutch Printing Ink Factories Van Son and T&K Toka Co., Ltd. The report provides an overview of these companies, followed by their financial details, business strategies, and recent developments.